At MaxOpp, we apply our proven dealer strategy of The 90-Second Romance to all your marketing campaigns and sales strategies. This suite optimizes existing customer databases, company website, Facebook page, CRM & Facebook Ads. We deliver consistent messages and content that create a strong and complete feeling of trust with both existing and new customers. "Our website has never been so alive and interesting ... more calls coming in about manufacturer incentives, major units & more requests for finance pre-approvals than ever before." *Results vary from dealer to dealer. Contact us for testimonials validating results. Most dealers have an idea what they should be doing but simply don’t have the time or knowledgeable staff qualified to devise a strategy, implement it consistently, and follow up to assure it is done 24/7/365 … until now. 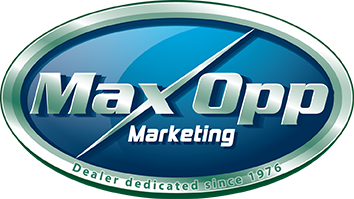 The 90-Second Romance works and with MaxOpp engaged, our dealers are free to focus on the customers we drive to their doors! (aka RAM) are potentially the greatest challenge and threat to the long term success of today’s dealers. Turning your digital marketing to MaxOpp assures your staff is free to concentrate on your on the ground needs!